In a discussion of the economic justification of Kaizen in the TPS + 1 ENGINEERING discussion group on LinkedIn, Kenyon Denning asked what Kaizen is and is not, and pointed to the English dictionary definitions on the web. Why look up a Japanese technical term in a general-purpose English dictionary? We should focus instead on what Kaizen means as a technical term in Japan. If we are using it to mean something else, we are misleading our audiences, because they assume that you are talking about the approach that has contributed to the success of companies like Toyota, Honda, Matsushita, Kawasaki, and others, and that is the only reason they are listening. And the problem is that we are indeed using the term differently. The most common usage is in “Kaizen Events,” a project management format developed in the US that does not actually implement Kaizen. The popularity of Kaizen Events crowds out the genuine Kaizen from practically all the Lean implementation programs in the US. To see it in the US, your best bet is to visit Japanese transplant auto factories. Over the past 35 years, Kaizen has become an English word. Among other data, Google about gives you the following chart of the use of Kaizen in English over time. This chart based on a search of Google Books by ngram viewer. After rising steadily from 1978 to 2000, it has been holding steady through 2008, the latest point provided, at 0.33 words/million. By comparison, for the same year, the following table gives Google’s occurrence rates for a few selected terms. I assume Google compares single words with other single words but I am not sure what it does with a 2-gram like “Lean manufacturing” that is used in speech like a single word. A business philosophy or system that is based on making positive changes on a regular basis, as to improve productivity. An approach to one’s personal or social life that focuses on continuous improvement. Japanese for continuous and incremental improvement, a business philosophy about working practices and efficiency; improvement in productivity or performance. The most common general language dictionary used in Japan is the Kojien (広辞苑). Its definition of Kaizen (改善) is “the act of making a bad place good again” (悪いところを改めてよくすること) and the example given is “improving the treatment” (待遇を改善する). The opposite is “changing for the worse” (改悪, Kaiaku). In 1985, the Japanese Factory Management monthly (工場管理) issued a Dictionary of Shop Floor Kaizen (現場を改善する辞典), which managed not to contain a definition for “Kaizen,” but, like Tozawa and Imai, it emphasized that kaizen is something everybody does, to make the work easier to do, produce better quality output faster and cheaper, while making the workplace safer. The list covers every known dimension of manufacturing performance except morale, which improves as by-product. To Tozawa, each discrete change is a Kaizen; to Imai, Kaizen is the process by which these improvements are made on a continuing basis. I have not seen an explicit emphasis in Tozawa’s writings about Kaizens being cheap, but it is implicit in the idea that the improvements are done by the people who do the work. Cheap, however, does not mean free, and Kaizen activities commonly involve giving individuals or teams license to spend a few hundred dollars at a hardware store for a project, but a $50K investment would be outside the scope of Kaizen. None of the English dictionaries says anything about changes being made in work methods, by the people who do the work, and requiring little or no investment. In none of the Japanese descriptions of Kaizen does it rise to the level of a “business philosophy.” The nature of Kaizen is best shown through examples, and I would like to share one that struck me as a particularly vivid illustration. About 15 years ago, Kojo Kanri focused an issue on Kaizen in the kind of dirty jobs that do not receive much management attention (泥臭い改善, dorokusai kaizen). There was in particular a story about a circle of high-speed train janitors who were tired of cleaning the same toilets 8 times a day. 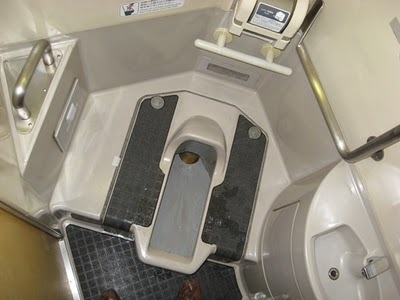 These trains were equipped with traditional, Japanese squat toilets that international passengers did not know how to use and messed up as a result. One obvious solution was to replace these toilets with the worldwide standard. It would have been no hardship for the Japanese passengers, because this style is already used in 90% of homes and work places in Japan. But replacing these toilets in 100 16-carriage trains could not have been done quickly, and was an investment beyond the scope of Kaizen. So the janitors took a number of simpler steps, and measured the results in terms of the number of required cleanings per toilet per day. This included posting some graphic explanations on how to use the equipment, painting outlines of where users should place their feet, and finally materializing the right locations with rubber pads to make it awkward to place your feet anywhere else. At the end of the project, the required cleanings were down to one toilet per day. Like many other words in the TPS/Lean lexicon I struggled long and hard to understand the literal meaning of the word Kaizen. My breakthrough came from the realisation that real understanding of the meaning of a word was not to be achieved from the study of the characters and letters of the words themselves; but from studying the behaviour, attitudes and results they created. In Zen Buddhism the measure of a teacher is not their own knowledge of a subject, but the understanding they can give to the people they teach. From my studies and practical applications over intervening 28 years I evolved the following explanation. Kaizen is an overall set of attitudes, tools and techniques. I have found the best way to get people to understand Kaizen is to explain why they need to do it, and the benefit they will personally get from doing it. At the start of our Kaizen workshops, I draw on a flip chart pad a man walking down a road followed closely by a road roller, I write on its speed as 3mph. I then ask the delegates, if we were that man and the road roller is our competitors, how fast we need to go to avoid being flattened. The answer is faster than 3, and we normally agree 6mph will be safe. I then point out that this is no good at all. To explain this I ask them to turn the clock back to 1962, the year I finished my apprenticeship and manufacturing was still a major part of the British economy. The man is a company called Norton, one of the world’s finest motorcycle manufacturers employing thousands of people, and the road roller is a Japanese company called Honda. If Norton were doing 6mph Honda were doing 1mph and were 100miles behind Norton, and posed no threat to them. I then write on the chart the current year, and ask where is Norton and the rest of our motorcycle industry. All gone, and Honda is the largest manufacturer of motorcycles in the world. What happened? We were that good and they were that bad, but we lost and they won. After a suitable pause, I then make the point that success in the long term business race does not go to those moving the fastest, but those accelerating faster than everyone else in the race. It doesn’t matter if initially you are last, as the Japanese were in cars, cameras, electronics etc., as long as you improve/accelerate faster than everyone else you will win. The Japanese have a name for this acceleration/improvement process; it is Kaizen. It is their word for all the activities that continuously improve of everything we do and create. Delivery the Fastest and on time. And be giving them ‘Delightful Experiences’ in all their direct and indirect contacts with the supplying organisation. These measures* (P.S.E and Q.C.D.D) must drive all the different elements of our Kaizen activities. Our future success is guaranteed if we can continuously improve these values faster than any existing or future competitor. Kaizen is about continuously achieving both sets of goals*. Yes, etymology is often not helpful, but, between the parsing of Kanji and induced behaviors and attitudes, there is also what an activity consists of. And Kaizen has some specific boundaries. It is not all encompassing. In the US, the so-called “Kaizen event” is widely believed to be a panacea. Honda widely practices Kaizen, mostly through its New-Honda Circles, but it is far from being all they used to achieve dominance in motorcycles. There is also, for example, the “racing spirit.” Soichiro Honda early on decided to get the company involved in racing and gave it the goal of winning all the major races in the world. At a time when the company’s main business was retrofitting US military engines on bicycles, his employees thought he was nuts. He explained that he wanted to instill the racing spirit into all of the company’s activities and, to this day, it permeates its project management practices, from product development to new product introduction. And it is really different from Kaizen. It is only in the last + 5 years or so that I have become aware that some organisations use it another way ( particularly America and UK) . They use it as a shortened version of the phrases “Kaizen blitz” or ” Kaizen project” …meaning distinct and finite projects to tackle particular problem areas in a business . They may then go on to say something like ” we practice kaizen in our business” or ” we practice lean or continuous improvement ” ….but this is not the case because (as I have said) they are actually selecting areas of the business within which there will be an exceptional intervention….as compared to the Imai definition of a pervasive culture of continuous improvement. Furthermore these organisations can also believe they are “continuously improving” because there is a regular renewal of the list of “distinct and finite” projects…..as compared to the daily Kaizen practiced everywhere. Michel …..there are some good examples of pervasive Kaizen in non Japanese companies. I am not authorised to name some…but one that is already in the public domain ( and I am not professionally connected with) is Unipart. Thanks for pointing out Unipart. One of the links at the bottom of the post is about genuine Kaizen work in an American plant from a non-Japanese company. There are good examples, but not the mass adoption of the concept that the on-line chatter would lead you to expect. Wow, all of you are commended for the research and persistence involved in trying to get to the “root” of the Kaizen definition but can’t it be made somewhat simpler and not risk losing an audience by defining in with “Kai means to change, fix, make new, improved attitude while zen means the ideal state, correct, the natural way of things, good, or make better which loosely and simply translated means continuous improvement. There’s the theory …and the practical ….and the lexicographic. Here’s my take on it. By 1985 my ‘what about the Burma railway!’ concern had faded as names like Panasonic, Honda, Pioneer, Canon, Datsun, Toshiba, Kawasaki, Olympus etc. had become more familiar. I joined NMUK and was given a little priming before heading off to Japan to learn 1) how to make motor cars 2) the wonders of Nissan and 3) the Japanese way of doing things. Beyond the common courtesies, another word became more familiar as time passed: ‘kaizen’. I woke our minder one day and asked him what kaizen meant. ‘Ah, you want to know? I will arrange!’ He responded. To get a straight answer I asked someone else, who said my mentor had observed I was (finally!) getting the hang of the job. A few days later my colleagues and I were informed that a couple of lectures had been arranged for us, after work, on the subject of kaizen. You may imagine our delight, bearing in mind we were guys who’d generally not laboured for a living for a while, and we were now on the tracks in steaming June. Mr Imai – a very personable headhunter who’d worked on behalf of many Japanese and US companies – came along and told us he’d noticed a reversal over the years from Japanese curious about the American way of doing things. He probed his contacts, and distilled and bottled what he learned – which he published in his book. In genba there were QCCs, and part of our training was to conduct one ourselves, by shop. Frankly, the challenges were thin, but I realised then the origin of the ‘QC Stories’ which could be found in abundance. It was clear some groups were better than others with their processes and results, and there were inter-shop / plant QCC competitions. QC Stories are now peddled as ‘A3 Problem Solving’ in some quarters (often with a Toyota label for good measure). Another aspect of kaizen was that there were targets for suggestions – I forget the actual numbers, but everyone was supposed to come up with ideas ….and there was a prize for everyone! The value of prizes was evaluated using a manual. The Cumicho / Cocho / SV could make awards up to a limit, and if the value exceeded that he elevated it to Kakaricho ….and so on. An individual prize might only equate to the price of a cigarette, but the team would pool all the awards and have a night out when the kitty was sufficiently loaded. 1. continuous improvement of the processes in order to simplify work and/or improve outputs 2. created by the people who do the work 3. with limited investment or significant ROI? Kaizen projects are, by definition, small, and, if your organization practices Kaizen, there are many of them going on simultaneously. To know the labor hours spent on a project, you have to record them. Tracking the labor hours spent on tens of concurrent Kaizen projects is not a minor task and, before undertaking it, it is worth pondering what the consequences would be. If you hire outside contractors to do projects on a time basis, then your cost is proportional to the time they spend. But Kaizen projects are conducted by contractors but by employees improving how they do their own work. The difference between paying contractors by the hour and using employees is like that between buying individual issues of a magazine and buying a subscription. In the first case, for every issue, you make a decision about whether you are getting your money’s worth with that issue. With a subscription, you are only asking that question at renewal time, and not for an issue but for a stream of issues. Do you want to track and justify the labor spent on every little Kaizen project, or do you want to review periodically what you are getting out of the Kaizen program? If a problem-solving circle consults an engineer, do you want the engineer to have a meter running? Or do you want him or her to do whatever it takes to help the circle? By hiring the engineer, you have “subscribed” to services. It means that you don’t need to evaluate every single micro-action. Breakeven time. It is a generalized Payback Period, for continuing outflows of cash. It is the time by which the cumulative inflows of cash match the cumulative outflows. It is focused on the short term. Just getting your money back is not the purpose of investing, but, if it takes 15 years just to get there, there is something wrong. Internal Rate of Return. If all the outflows were loans you make and the inflows the reimbursements from the borrower, the Internal Rate of Return (IRR function in Excel) would the interest rate of that loan. It measures how profitable your investment is over its entire life. If you get your money back in three months but nothing thereafter, it’s not an investment you want to make. The practice of Kaizen in Japan includes activities that will avoid losing the improvements gained. I have learnt two fundamental rules of Kaizen from my study and practice of TPS/Kaizen in Japan (20 visits) and with my European clients (1100 workshops). They did not receive sufficient attention when TPS was translated into Lean thinking. This could explain the difference between Japanese and some Western academic interpretations of Kaizen. 1) Can we remove it before we improve it? This is often lost in the complexity of VSM. 2) Maintain the gains, sustain the change. I speak from personal experience when I say this can be a challenge to the western mind, unfamiliar with the concept of Yin and Yang thinking. The lean thinking lads missed this one, as I initially did myself. The second rule is essential to maintaining the improved situations and ensuring no future deterioration occurs. Standard work at both the macro and micro level is designed to do this. The standards must apply to; Methods, Manpower, Machinery, Materials and Measures. One of the key elements of the standards is that they are visually controlled. 5s has a major part to play in achieving this. The goal of 5S is to make the visible in the workplace for the 5M’s; What has to be done — How it has to be done — And what is actually happening. The objective is to make abnormality visible. TPS will create a smooth flow of products through the organisation. What does not receive sufficient attention is the role of TPM in ensuring a smooth flow of products through our machinery and processes. TPM is also designed to stop deterioration of the plant and equipment. And keep it in optimum condition. There should be a planned maintenance and autonomous maintenance programme for the life of all our key equipment. Once we have secured the improvement and ensured there will be no deterioration (YANG-Rigid thinking to standards). We can press on with the continuous improvement process (YIN – Flexible thinking). It took me many years to get my western mind comfortable with this Yang-Yin idea. When we are discussing individual elements of TPS we must never lose the overall view of our journey. I like to explain what we are trying to do with a simple explanation of the total process for achieving competitive advantage. JIT. This is the smooth (waste and defect free) flow of existing and new products and services through your organisation. This must give our customers the best PSE in our industry. TPM. This is the smooth flow of products and services through your machinery and processes. Kaizen. This is the flow of your people’s Talent, creativity and enthusiasm. Taozen. This is the flow of change itself. Management is responsible for creating the environment to start and sustain this process. From these four flows Toyota created their Production System and a torrent of competitive advantage. All we are trying to do is duplicate this process. We must always remember the map is not the country. The words are not the subject, they only tell you about it. When you have understood through practice you understand with the 3 H’s;* Head, Heart and Hands. In the middle of these threads I can sometimes hear Sophocles words from 470 BC when he said; “One learns by doing, for though you think you know it, you have no certainty until you try”. “It is easy to remember theory with the mind; the problem is to remember it with the body”. I too worked for a Japanese company and spent some time studying the Japanese culture (Toyota was our biggest customer). I agree with you when you say it is a culture. Even more so it is a way of life. By that we mean it is second nature and done without thinking about it. To your point of suggesting that Americans want to know the meaning of Kaizen. I once knew an engineer when congratulated by the CEO on saving the company 12 million dollars by his process control ideas replied, that’s my job. This engineer really believed it was not that special because his culture was really “that’s my job” not why, or look how special, or anything other thoughts. I fully agree that Kaizen is to establish a culture in the company, not a project/program. For a good/successful start, the right understanding/support/involvement from the management is a must, first step is top-down, then bottom-up with the full involvement of whole of organization—new company culture. I woked in Siemens company and have the chance to work with Mr.Fujii, we had a great achievement during last more than 10 years! There is what Kaizen is there is and what you need to do for Kaizen to be practiced on a shop floor, in a plant, or in a company. These are two different questions, and you need the answer to the first one before you ask the second one. I do not believe that what is keeping so many American companies from implementing Kaizen is culture or lack of commitment. Instead, it is that the managers have never been told what it actually is. I don’t think it is helpful to bring up Japan versus “the West,” whatever that might be. Differences in national cultures are only ever used as an excuse to not doing, never as a reason to do. They are always disablers, never enablers. An improvement is an improvement, and it does matter whether it is in Nagoya, Chennai, Chicago, or Moscow. The ultimate Kaizen- continuous improvement activities (Japanese, English. etc) must be focused on ourselves and our ability to contribute to the welfare of our family, friends, business associates and our society. Our society should be seen as local, national and global..
We are on a journey to develop successful businesses; but our journey is also about the development of our humanity. I find the following story helps me understand the humanity part of our journey. God replied “I did – I sent you”. There are many people who ‘exactly knows’ whats the meaning of all the things. The really is that meaning of many japanese words remains hidden in english (worse in spanish). The Japanese People who see the life with diferent values, interest or meanings; indeed use words with differents meanings; if we only pretend to translate the methodology, we will produce many faults. To use TPS require understand -first- what the methodology want to get, then we have to validate if it will occur in our Occidental culture. Apply TPS is easy but not simple (it could be complex). My concern is not nailing down the exact meaning of Kaizen. Instead, it is that we are missing out on a valuable approach because its name has been mistranslated and the mistranslation has been crowding out the accurate one, on which there is a broad consensus in Japan. Think of it as what Disney has done to the classics or other cultures, from the Hunchback of Notre Dame to Arabian Nights. They take outlines of the original stories and bowdlerize them beyond recognition, according the marketing formulas. All Disney heroes are orphans, so Aladdin is an orphan, except that, in Arabian Nights, he is the son of a tailor. It would be fine if the Disney version didn’t crowd out the originals worldwide. As the experience of Japanese transplant factories in the US shows, the original version of Kaizen works just fine with American workers. There is no cultural block, and the local companies that are not doing it are missing out. How is it in Peru? Is Disney’s “The Emperor’s New Groove” an accurate rendering of Inca culture? Which version of Kaizen do you practice? “As Dr. Youngman says “Westerners miss the social context”; we can’t simply translate a word, we have to relate this word in a wider context, even within as difficult as the social one. In fact, genuine Kaizen in the US has been practiced with success in Japanese transplant companies and their suppliers, through suggestions systems and small group activity. When small group activity was tried in American companies in the form of Quality Circles in the early 1980s, it worked. I saw it personally in the semiconductor industry. Quality Circles were abandoned in the US after a few years, because managers had started them with the unreasonable expectation that it was all they needed to do to make their manufacturing practices competitive. When they realized their mistake, they threw out the baby with the bath water. Elsewhare, small group activity still thrives, not only in Japan and Japanese transplants in the US, but also at least throughout Southeast Asia. See Jon Miller’s article about this in Quality Digest. Later on a Dr Imai noting the Western confusion regarding the philosophy behind Quality Circles saw an opportunity and set up what he called the Kaizen Institute. All of the philosophy was identical to that of proper Quality Circles and still is but westerners do not understand this, the Japanese do! I disagree with the writer above who says that things that work in Japan do not work in the West due to cultural differences. This has been disproven over and over. The only reason why they appear not to work is because those who attempt to implement them simply do not do their homework and what they do is flawed. If you attempted to implement them the same way in Japan they would not work there either! What a fantastic series of comments! This is why I continue being a student of Lean. Great minds out there and I am proud to be (remotely) associated with you all. Implementation of Lean in an industrial construction world brings unique challenges, not the least of which is the command/control culture. It is difficult to overcome the egos in our business and one must continuously remain aware that these egos must be “managed” by implementers. Change is slow, but change is happening! As to Kaizen, our industry is very much aligned with the western definition. Many cases of outside expertise being brought on board to identify and resolve under- producing aspects come to mind. All of which (I am happy to say) involve the workers at the work face, but none of which (I am sad to report) involve the cultural shift necessary to truly achieve long-term continuous improvement. We are seeing improvement with individual opportunities, but very little improvement in the mindset of our leaders. Letting go and trusting the workers is still on the distant horizon. I’m guessing that those in manfufacturing (having limited/little success) are also suffering in similar ways. We will continue to fight the good fight with what I like to call “Patient Tenacity”, with the long term goal of seeing true cultural change. The Agile Scrum methods are effective I have noticed, much like the Peak method is fitness training…very intense but short workouts (mental or physical) with longer periods of resting and thinking seem to improve fitness (or creativity). Perhaps all of the small group efforts are effective if kept short and intense, with repeats often? The problem with suggestion systems is there is no intensity (and usually little followup) in most companies. That was the problem with some of the less successful Six Sigma efforts, too-long meetings, slow single-person data analysis, no intense small group sharing often repeated as new data emerges. The best LSS hybrid sites seem to maintain the intensity of purpose and action by much shorter meetings and lots of 2 or 3 person data analysis “spurts” with results graphed and shared with bigger teams for validation or comment, daily. Also sorting out problems best solved by fine tuning vs those best solved by major re-design or “breakthrough” effort. And mix and match of those ideas. Sustained results for customer matters, regardless of guru-based method used. The optimum method seems to vary greatly by industry in my experience. Taguchi for electrical problems, Shainin for mechanical problems, MacGregor for continuous processing, TPS (or lean) for logistical problems, mix and match for semiconductor industry. Small group activity, patterned after Quality Circles, is not in the form of intense spurts. Typically, a circle is a team of 5 to 8 volunteers for one year, during which they work on a succession of projects, each of which lasts about four months. The circle meets at least once a week but preferably twice, in overtime. In addition, the members may come once or twice for each project on week-ends to advance implementation. My experience with Kaizen in the US is far different from that which occurs in Japan. Having work experience in both countries help open my eyes. In the US, my Kaizen experience was usually a large meeting with many people in attendance, tended to last 1 to 2 days, and was called the ‘Kaizen event’. The sessions were so large and lengthy that people attending lost focus. It was rare that the groups were small. Post Kaizen events, break out teams would be formed yet if the work was not part of the individuals yearly goal sheets, some staff would fail to attend follow up meetings. I think kaizen is probably the same in both places – we just have variations based on evolution or expectations. The Kaizen blitz was “sold” – I believe it was a marketing tool – as a means to make bigger improvements and sell projects. But that that does not prohibit the smaller change process. The companies that use it must have found it successful if they keep on doing it. It is not my favourite technique as the benefits can fritter away if there is no plan put in place to sustain it. Also, a few days/a week might not be enough time to understand the problem. It is enough time to map a process and identify all the issues, though. Then we can plan time for improvements that create the minimum disruption. I believe that teams work better than individuals and so would use a small team wherever possible. A core team that is able to call in help as needed. However, whether we make small changes, bigger “step” changes or technological jumps, we are still climbing the stairs to try and be the best we can be. I am not arguing against the “Kaizen Blitz.” In fact, I think that, where appropriate, it is an excellent tool. My issue that it is misleading to call it Kaizen, and that, by doing so, we are crowding out the real thing. In companies in the US that are using Kaizen events, or blitzes, management believes they are practicing Kaizen. If, however, they visit good Japanese plants, they run into people who have never heard of “Kaizen Events,” and to whom Kaizen is something different. What do you think in missing in the American version? The dominant form of activity in US Lean programs is the “Kaizen event” which isn’t Kaizen at all. Many American companies had short-lived “Qualiy circles” in the early 1980s. Apropos of the general flavor of this discussion – the language and cultural differences around Lean/CI are a fascinating area ……. I thoroughly recommend reading Ishikawa’s ‘What is Total Quality Control? The Japanese Way’, mostly for the section on ‘Japanese Experience vs Western Experience’. It’s remarkable for the casual racism, broad sweeping generalisations, astonishing cultural judgements, religious bigotry, and just plain racial superiority – even to the point where the translator disavows himself of endorsing Ishikawa’s views! Notwithstanding the success of Toyota and other great Japanese firms, a lost generation of growth and deflation would somewhat temper asserting a cultural predisposition to CI between nations and cultures and across languages. I once shared that view of the culture being important. Now I’ve come to the view that, while important, the variation between organisational cultures within a country far exceeds those of the national cultural and language differences….. I agree both on the specifics of your comments on Ishikawa’s book and on your general statement that organizational culture trumps national culture. I was particular struck by this fact when consulting in plants from a multinational company located in the US, the UK, Italy, and the Netherlands. Besides ideas on how to make things, organize businesses, and work together, Japan has given the world outstanding art, literature, architecture, movies,…, and people who can be the most faithful friends. That is the bright side and what makes it a fascinating country. Unfortunately, as you point out, there is a dark side, and not just in Ishikawa’s thinking. I experienced it while living in Japan and it is the reason I did not stay. This being said, you also see comments in these discussion groups that are equally prejudiced, to the effect that there is nothing new in TPS and that it is just stuff that was taught by Americans after World War II, denying the existence of any innovation in Japan in nearly 70 years since. We just need to look past this, evaluate ideas on their own merits, and judge people as individuals, on the content of their character. Before implementing Japanese principles like Kaizen, we need to understand Japanese culture and their management first. Just translation of words does not yield results. I personally believe the implementation to be challenging if the culture is not supporting, which is almost taken as granted. Life long employment, more hands on management, Movement of people through ranks etc. I don’t know if I am wrong , but have seen very shabby implementation of kaizen by the industries and people, finally failing in the end. Common sense and fixing up the simple things are not so common as it seems. Every one knows across all nations that need to keep things clean, fix up the things as son as possible, zero tolerance for the problems, exchange of ideas tec. Nothing is rocket science but still get missed unless there is some external push from the system at varied level depending on the nature of the people and their sensitivity. Come across some cases where six sigma and week long discussion has come to a conclusion that normal cleaning has to be done on regular basis and surprisingly every one agreed as if they do not know from the beginning. Some times simply making people do very small and honest things can yield miracles. Conviincg them is a big task though. So ” Kaizen” from Japan with a history of successes across industries do help. If we had to wait to understand a national culture before using, surely we never get anywhere? Should we not look at what we are trying to do and work with the people we have and not try and become someone/something we are not. Finding a process that is poorly laid out (using the lean wastes) or wanting to give a customer the best service you can, or seeing a badly run machine and wanting to fix it is not unique to any one nationality. The person standing next to you is unlikely to think as you do, so why should we expect them to think like folk from another country? I know that I think differently from many. Sometimes it has created problems for me. I can look at the way something is done (and has been for years) and often see things that just don’t make sense – to me. Imagine how often I visit companies and identify possible improvements only to be told they already know about some of the issues or have been planning to do something about them – forever, but have just never gotten round to it. The culture we need to develop is not that of another nationality but one of simply wanting to make things better. Surely, we should adapt the processes to suit us, not “us” to suit the processes.